In the past, presidents loftily ignored their opposition gadflies as being somehow below the presidential salt. Those in Connecticut who long have known there is no more dangerous place in politics than that between Blumenthal and a television camera may be inclined to admire Trump’s courage. Trump, some may have noticed, is not averse to engaging in political fisticuffs. The dispute between Trump and Blumenthal clearly turns on a matter of honor. Neither Trump nor Blumenthal have yet challenged each other to a duel, perhaps because dueling has long been outlawed in the United States. The practice was petering out when Democrat state auditor James Shields challenged Abe Lincoln, then a Whig lawyer, to a duel in 1842 owing to several sharp letters he thought had been written by Lincoln. The quarrel was patched up and the duel shelved. The honor of all involved was preserved. It seems almost indecent to speak of honor in connection with tweeting politicians and Democrats who have their sights on Trump’s presidential hide. However often Speaker of the U.S. House Nancy Pelosi denies it, anti-Trumpers, Blumenthal among them, appear to be assembling an impeachment case; in a pinch, they may be satisfied with a process-crime prosecution once Trump leaves office. The notion that Trump engaged in a collusion with President of Russia Vladmir Putin to deny presidential candidate Hillary Clinton her presidential ambition is – just fetching for a word here – farcical. And Special Prosecutor Robert Mueller said as much in his report, filed nearly two years after a lengthy, thorough and professional investigation. Mueller, Attorney General Bill Barr has reported in a summary of the investigation, has discovered no evidence pointing to a conspiracy or collusion between Trump and Putin the object of which was to deny Clinton the presidency that she felt was her due. As a former prosecutor, Blumenthal should know that collusion, unlike conspiracy, is not a crime. And because collusion is not a crime, no amount of evidence assembled by Mueller demonstrating collusion could result in a prosecution. High proof bars have nothing to do with the matter. 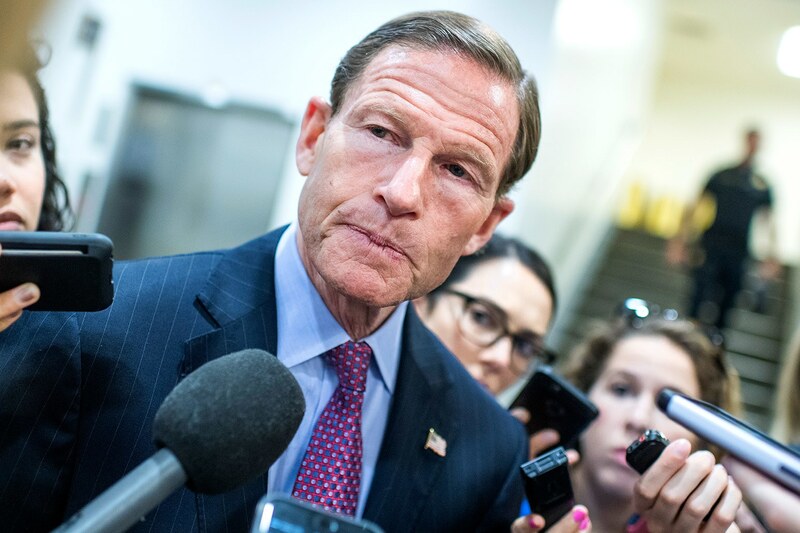 In the light of Barr’s claim that Mueller found no evidence of collusion, Blumenthal may possibly, though unreasonably, claim that Barr’s interpretation of the Mueller investigation is in error. He has not made such a claim. Nor has he been asked by CTMirror to affirm such a claim. In the meantime, all the crooks and bends in the political arena might easily be settled by the reinstitution of dueling. But the chances of this happening are as remote as the notion that Barr’s summary of the Mueller report is wrong in its conclusion that Mueller found no evidence of collusion. In the absence of collusion, no conspiracy can ensue because conspiracy without collusion is like Blumenthal without access to a television network.